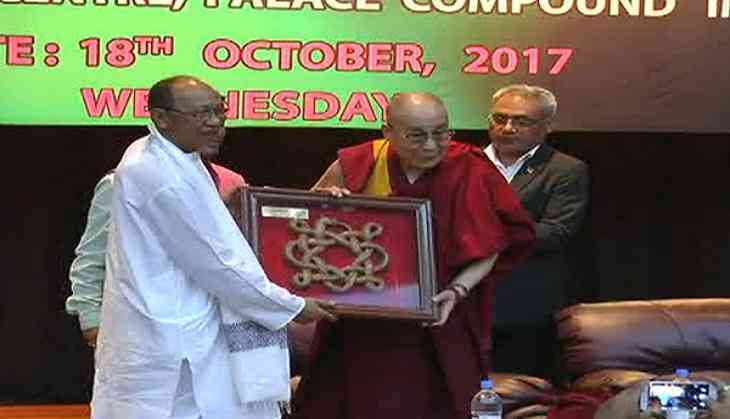 The 14th Dalai Lama during his three-day maiden visit to Manipur addressed at the International Peace Conference in the capital. The conference was aimed at promoting peace and harmony in the northeastern region. Addressing at the gathering, the Tibetan spiritual leader urged the people to promote the feeling of oneness and welfare of all. He said, "I firmly believe that in today's world we need a sense of oneness among the 7 billion human beings and that is the basis of infinite Karuna (compassion)." The conference brought a host of religious leaders from various countries, including Buddhist monks from South-East Asia and Myanmar, under one platform. Issues related to maintaining world peace were discussed in the conference, besides solutions concerning human development and various aspects of crime and violence were also taken up. The Dalai Lama said that all the tradition and religions have the same potential and can serve humanity to bring inner peace. He added, "Everybody wants a happy life and has the right to live one." Such international peace conferences provide a better perspective of the world issues and act as a platform to come up with better ideas to bring conflicts to an end. The conference was held on 18 October.